The Arktika vessel is unique in the world, "it opens up brand new opportunities for the country's defense capacities and Arctic development projects," the Rosatom director said. The Baltiysky Zavod - Sudostroyenie LLC shipyard launched the lead nuclear icebreaker of Project 22220 Arktika on June 16, an Interfax correspondent reported from the launch ceremony. "The icebreaker will join the fleet of the Atomflot federal state unitary enterprise by the end of 2017," Rosatom Director Sergei Kiriyenko said at the ceremony, adding that the Arktika project was "a great victory from every angle." 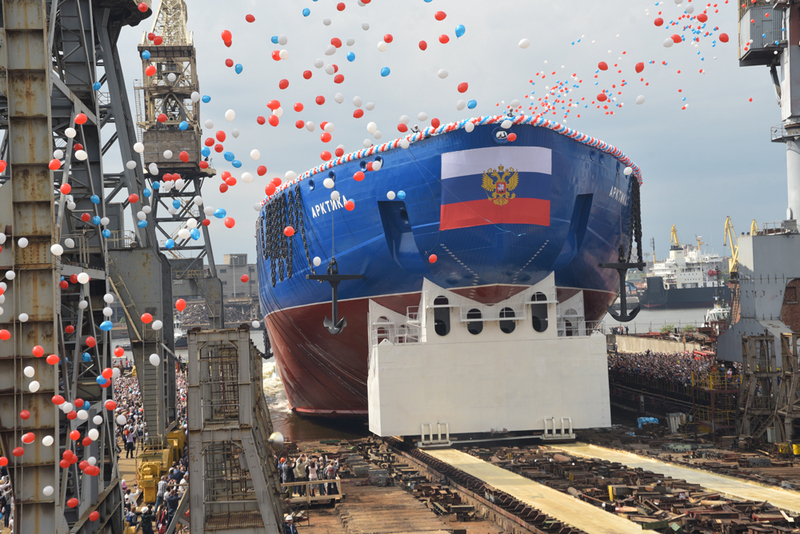 In turn, United Shipbuilding Corporation President Alexei Rakhmanov said that the vessel incorporated unprecedented solutions. "There is one minor effort left to be taken, you need to finish the construction of this icebreaker on water, and I hope it will start working in the Arctic in the end of 2017," he said. This year the shipyard is also due to launch the Viktor Chernomyrdin 25 MW diesel icebreaker, to prepare a floating nuclear power plant for fuel loading, and to start the construction of a third icebreaker of Project 22220 Ural, Shipyard General Director Alexei Kadilov said. "Hopefully, we will not let down our client and will deliver the icebreaker [of the Arktika project] in due time," he said. Atomflot and Baltiysky Zavod - Sudostroyenie signed a contract for building the lead nuclear icebreaker of Project 22220 in August 2012. The project costs 37 billion rubles. A contract for building two serial nuclear icebreakers of Project 22220 was signed between Baltiysky Zavod - Sudostroyenie and Rosatom state corporation in May 2014; the contract has a value of 84.4 billion rubles. The icebreakers of Project 22220 which are under construction for Atomflot have a length of 173.3 meters, a width of 34 meters, a design draft of 10.5 meters, a minimal working draft of 8.55 meters and a displacement of 33,540 tonnes. These icebreakers have a two-reactor power unit with the principal source of steam coming from the next-generation 175MW reactor unit RITM-200 specially designed for this type of vessel. The dual-draft design of the vessel makes it possible to use it in Arctic waters and in estuaries of polar rivers. The lead, first and second serial icebreakers are due to be commissioned in 2017, 2019 and 2020, respectively.